When we bought our house almost ten years ago, it had not meandered nearly as much and we had significantly more embankment/real estate than we do now. Over the last decade the creek has cut deeper and deeper into the embankment and we now have lost about 8 - 10 feet of property at the top of the slope due to erosion of the embankment. We are now about to lose our fence which runs along the top of the embankment and I think this is finally the year that I need to do something to stop the erosion of loss of real estate (and our fence). One thought I had was to see if I could (as impossible as it sounds) redirect the creek to flow straight rather than to meander. This would prevent the creek from cutting into the embankment any further. But it wouldn't stop erosion from rain which is now just as much a problem as the creek. To fix the erosion issue, I'm wondering if there is any material I could apply/spray/whatever to the entire embankment? I know on the side of highways I often see rocky cliffs with some kind of retaining netting that helps "pack" in the rocks and loose debris from falling onto the road. At this stage I'm just looking to review my options so I can weigh them and only then drill down into their logistics so I can figure out which way we're going to go. 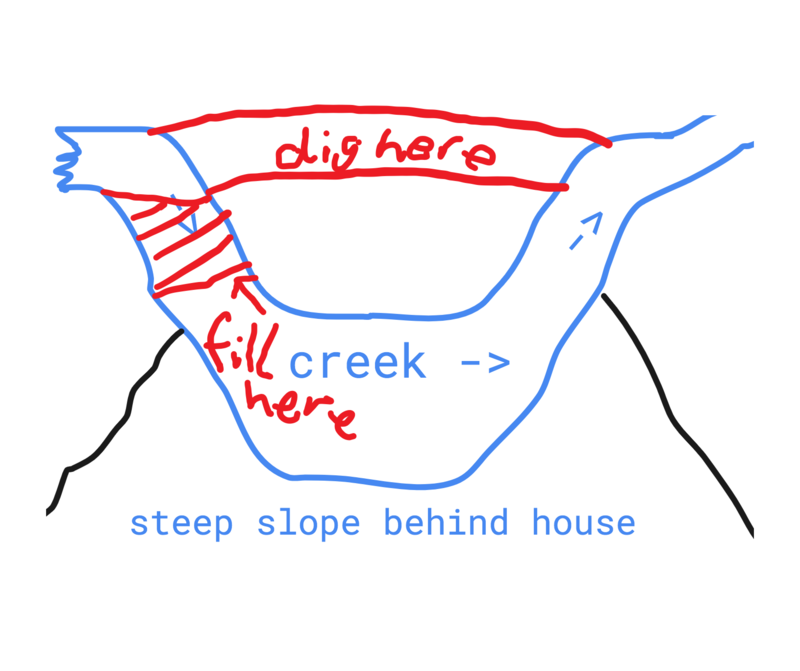 So, options-wise, what are some solutions out there that could help with both problems (that is: preventing the creek from meandering any further, and erosion of the embankment due to the creek and rainfall)? This is often a complex legal situation due to regulations that affect (in many parts of the world) what you can do in or near a body or stream of water even if the land next to it or around it belongs to you; not to mention the fact that you are fighting with a force that has literally shaped the planet, and it's inexorable and quite capable of undoing many things you try to do to stop it, if, in fact, it is even legal for you to try to do those things. If the stream also is a property BOUNDARY, the legal implications of trying to move it get even more complex. The "wire mesh" you describe is most probably gabions, which are empty wire cages which are stacked and filled (pretty much by hand, which has taken a novice contractor or two by surprise, to their cost) with rocks. Another common technique is "rip rap" which are simply large rocks layed over the face. Pick a low quality concrete sans water, place it at your leisure and let the rain /moisture make it go off. It's a common civil engineering technique, and very efficient in terms of cost, effort and design experience. It also requires very little ground preparation, which for gabions can be quite some effort as the're regular shapes. Eventually the bags rot away and the concrete remains. There's a (UK) supplier's fact sheet here, where the bags come pre-filled on a pallet. As mentioned in another answer, there may be legal issues since the creek is a waterway. In the US, you would have Federal and probably state laws involved (many other countries have similar laws about waterways, even if you own the property). I would not try to fill the creek bed back in without approval, even if it is technically your property. What you really want here is a retaining wall that has some sort of better resistance to the creek. Ideally you would want something like a concrete wall (say 4ft above the water line, extending below) along the creek bed with some sort of support rods running back into the earthen hill (lest the hill push the wall over). You could add some retaining wall ceramic bricks above for support and aesthetics. Since this would control erosion, it should get regulatory approval. Been there , done that; my creek ( Plum Creek, Highland IN) was 30ft. width and embankment was 40 ft. high. I "coated" it with railroad ties, bricks, and many cuttings of trees and bushes. To reach my height I used 3 tiers of RR ties with slopes between. It required a lot of stuff and work. Yours looks much more manageable. Look for affordable rip-rap ;aka brick, cinder block, broken concrete, large size gravel, etc, to break the current . I used reject bricks from a nearby factory that sold them very cheap. For my larger project I used 24 yards/ about 48 tons. I suggest the mesh you have seen on highways and hold it in place with your rip-rap. Then stick a bunch of cuttings of trees that grow well in your location , early spring will work best . Then throw out a bunch ( 50 #) of seed like annual rye grass ( best in the fall ). If you like gardening it could be a great hobby area. Depending on how fast and high the stream gets ; two rows of railroad ties near the waterline will give you about 16" of "seawall". Depending on your budget , there are many options available for seawalls. If rainwater is eroding gullies ;they can be slowed with grass sod, but sod will need some sunlight. This answer is from the perspective of what one person can do without power equipment, other than a 10 wheel dump truck to deposit stuff at the top. What I’ve seen commonly done is either large rocks or large chunks of concrete dumped to protect the area eroding. You say it is slow moving, so I’m betting the erosion primarily happens during/after rains causing high, fast moving water. I think you’ll want pretty large rocks/concrete at the base (like maybe 2.5’ or 3’). If you own the other side, you can help straighten that section out by excavating that area. Adding to some already good answers, I'd emphasize using vegetation to help stabilize the bank. Only one answer (https://diy.stackexchange.com/a/162118/76258 - a great one) mentioned that so far. My construction experience is limited but I have seen streambank stabilization done in various forestry operations. Vegetation and riprap is the key technique stabilizing remote stream banks that are near forest roads or for some other reason are being intervened with to mitigate erosion. Dropping logs, woody debris, and stones into the river banks as directed by local expert ecologists/biologists. Planting fast-growing trees that spread roots and shoots to stabilize soils, like shrub willows. 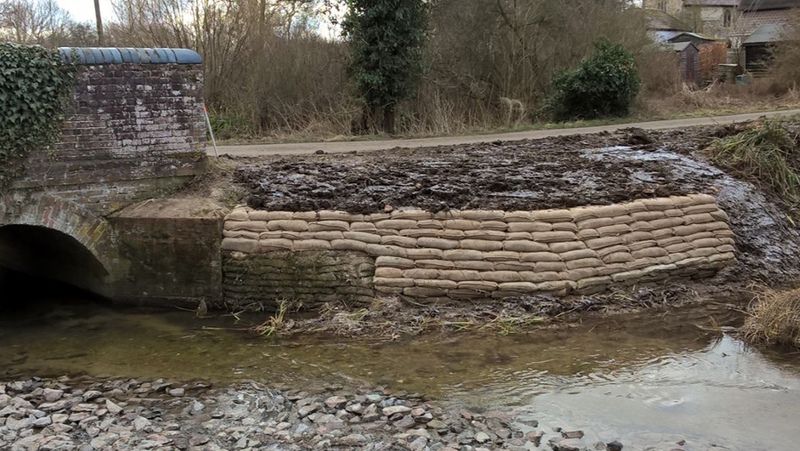 The goal is to slow up the water and break up its flow path, to reduce the volume and velocity of water chiseling away at the river bank. Upstream of the erosion-prone area is important to consider and work with if possible, as conditions there (e.g. channelization to prevent flooding upstream) can exacerbate the problem at your area of interest. "We're all downstream." Even for these more local-nature-based options it'd be wise to consult with your local environmental department to learn from their expertise on your area's unique hydrology and geology and regulations. They are interested in making these situations better, as erosion is bad for you, the area's real estate overall, and downstream environmental quality. These kinds of situations are easy to make worse, e.g. channelizing streams seemed like a good option for many cities that are now finding it's important to let floodplains do what they are naturally inclined to do: periodically flood. Vegetation and riprap is a fairly safe, time-tested/nature-proven way to mitigate erosion, but done haphazardly these techniques could cause immediate or long-term problems as well. Not sure where you are, but definitely check with some local authorities, such as your state (if in the US) Department of Natural Resources or equivalent, or the federal Natural Resources Conservation Service. Most modifications will need some sort of permit, and a lot of places have programs available to help landowners with such issues- I know us in the environmental/conservation fields do NOT like to see such erosion occurring! I'm going to preface this answer with I Am Not A Lawyer, but I am a civil engineer and extremely familiar with embankment stabilizations. There are a few solutions to this problem and they generally follow the mantra of Want it Fast, Want it Cheap, and Want it Right; pick 2. You're good with this not necessarily being right. This answer will fix your problem, at least for the short-term and might create exciting new problems for you. 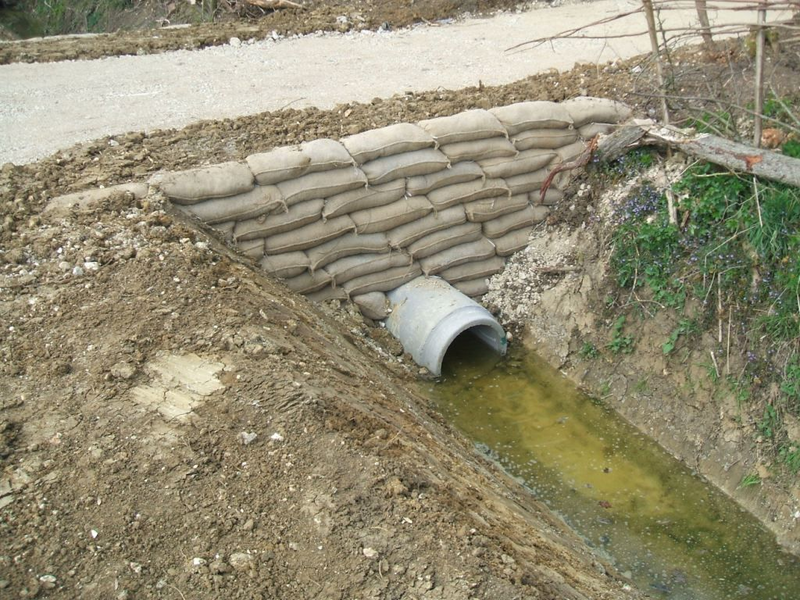 Cut a trench for the stream and direct it away from your embankment. This may be illegal to do as it may involve trespassing, violations of environmental law, may create floodplain issues, and may not prevent the stream from meandering back over time depending on the stream's hydraulics. You could get this done as quickly as you can dig a channel. Hire an engineer and lawyer in your jurisdiction to evaluate the issue. They will be able to determine what laws are applicable to your issue and design a solution that complies with the relevant code requirements as well as assist you in securing any applicable permits required before performing the work. Depending on the turnaround time for permits, you could probably get this done in a few months. Depending on your jurisdiction, there may be remedy in the municipality that you live in. In New Jersey, all municipalities are required to meet the requirements of municipal level permits to control stormwater outfalls and waterbodies within their jurisdiction. Were you located in such a jurisdiction, your municipality may be obligated to hire an engineer whom would be tasked with designing a solution on your behalf and the municipality would hire a contractor to construct the repairs for you. This requires you contacting your elected representatives as well as whomever is your jurisdiction's engineer; anticipate some runaround. Going this route is likely to take a few years. Without reference to the legal situation, just in practical terms... excavate a new channel for the water and build a dam stopping it coming your way. 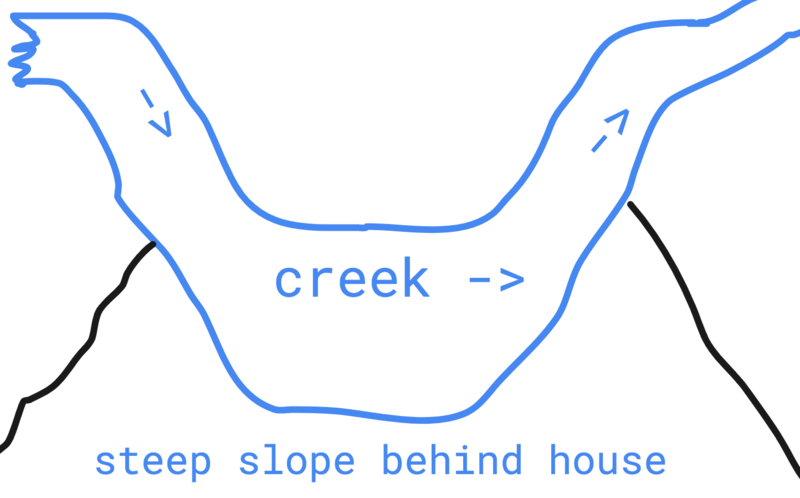 If you make the channel concave towards your side, it's more likely to meander away because water flows fastest on the outside of the bend and causes more erosion on that side, while depositing on the inside of the bend. In terms of a material / engineering solution - you might want to look into Gabions. Wire cages you can fill with rocks. Forget concrete, steel, sandbags, rocks, lawyers and consultants. TREES have roots that hold the soil bank together. Willow would definitely work, but maybe take over downstream. Sterile grasses for short term. Dave Kimble is a new contributor to this site. Take care in asking for clarification, commenting, and answering. Check out our Code of Conduct. Not the answer you're looking for? Browse other questions tagged water structural engineering or ask your own question. How can I tell if stains are caused by a ceiling that is drying out, or if there is still a leak? Where could the water be coming from found in this hole my dogs dug?